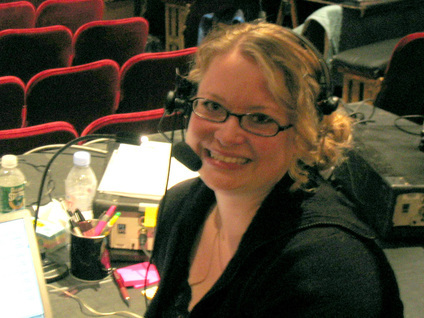 Anne E. McMills is a lighting designer and associate lighting designer. Her far-reaching career extends across the many facets of the lighting world—from theatre, including Broadway and the West End, to television and theme parks to architecture, industrials, concerts, award shows, dance, and opera. In addition to designing her own work, Anne has assisted many award-winning Broadway lighting designers, including Ken Billington, Brian MacDevitt, Howell Binkley, Peter Kaczorowski, Jason Lyons, David Lander, Brian Monahan, and others, as well as projections designer Elaine J. McCarthy. Anne has mounted productions in the United States, Japan, Australia, England, Scotland, France, and Germany. Anne is a proud member of United Scenic Artists, Local 829. Anne achieved her BFA degree in Theatre Design: Lighting from Millikin University in Decatur, Illinois, and her MFA degree in Lighting Design from Mason Gross School of the Arts at Rutgers University in New Brunswick, New Jersey. While pursuing her thesis research, Anne interned at the Royal Opera House at Covent Garden and the Lyric Theatre Hammersmith in London, England, as well as the Opéra de Lyon in Lyon, France in order to analyze the comparison between American, British, and European lighting design practices and technologies. In addition, Anne is the the author of The Assistant Lighting Designer's Toolkit and 3D Printing Basics for Entertainment Design. Currently, Anne is the Head of Lighting Design at San Diego State University.